Ringwood Athletics coach Todd Ireland could potentially have 4 of his athletes line up in the final of this year’s Stawell Gift 120m Men’s Open. Jason Bailey is one of the favourites, along with last year’s runner up Hamish Adams, and teammates Daniel Sonsini and Matt Burleigh. The boys are mates and train together 4-5 times a week as well as spend time travelling and staying together for meetings all over the state and further afield. “Stawell Gift is definitely the one to win, it’s at the top of the pedestal, the most prestigious gift to win. When we get to Stawell we all stay together in Halls Gap, it’s a great social occasion and we have a lot of fun,” said Jason. Todd Ireland, who himself won the 100m Masters last year, is confident on behalf of the group, who he says have all had a good run this season in most of the big finals. “Matt has been in just about every big final there’s been, Daniel won at Berwick only last week and Hamish at St Albans. Jason has had four wins this season,” said Todd. “Jason’s in really good nick. 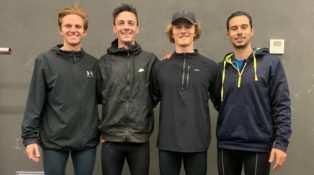 Seeing his training partner Hamish get so close last year has whetted his appetite and helped him believe that winning the Stawell Gift is a real possibility. Jason has done everything right and really applied himself. Add that to his experience gained in making the semis last year, and it is no surprise Jason is a favourite this year. Matt Burleigh, a teacher from Croydon Hills, has been a semi-finalist in the last two Stawell Gifts and placed in the top 5 in 6 of the big Gifts this season. Daniel is a stay-at-home dad from Wantirna South and is also a Stawell Gift semi-finalist, and who could forget the look on Hamish’s face when the apprentice electrician from Croydon ran 2nd to Jacob Despard in 2018? !